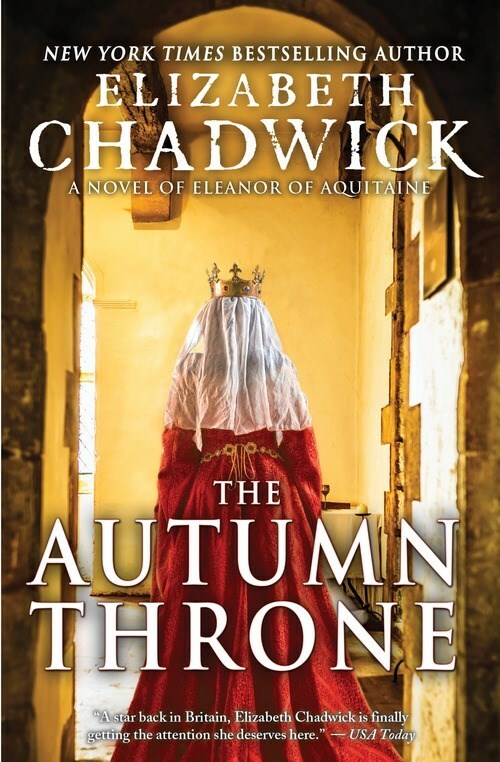 This is the final book in Elizabeth Chadwick’s historical fiction trilogy on the life of Eleanor of Aquitaine. It follows book 1, The Summer Queen, and book 2, The Winter Crown (previously reviewed here). THE PLOT: Exploring the final 30 years of Alienor’s life, Book 3 starts with her imprisonment at Sarum after her sons’ failed rebellion against their father, King Henry II. Occasionally, Henry will pull Alienor out into the world…usually if he wants something from her. For a while, he tries to convince her to grant him an annulment and become a nun so he can marry again. Of course, there’s no way Alienor is going to be bullied into giving up her titles. In the meantime, Henry continues to play mind games with his sons: Harry, the Young King; Richard; Geoffrey; and John, who watches his father’s slimy ways with women and politics and learns to emulate them. Death robs Alieanor of too many of her children, including Harry and Geoffrey. When Henry himself dies, Alienor is finally free…and her favorite son, Richard, becomes king. A new phase of Alienor’s life opens as she becomes regent while Richard is first on crusade, then imprisoned. Surviving son John is a thorn in everyone’s side, but Alienor now also has some beloved grandchildren as her companions. MY TWO CENTS: I loved this whole series. This book might have been a bit of a challenge for the author, as Eleanor spends the first chunk imprisoned and stripped of power. But Chadwick deftly uses this part of history to show what Eleanor might have done to occupy her time, and anyway, it’s all the more satisfying when Eleanor outlives her tyrant of a husband. In addition, we get some perspective into John’s thoughts and machinations, starting from when he’s pre-adolescent. It also could have become a bit depressing, as there are so many deaths and the reader knows Eleanor’s own death ends the book, but it never seems to be a “feel bad” downer book. I think most readers of historical fiction already know the basic historical facts, and the book’s job is to make that history come alive for the reader. Every Elizabeth Chadwick book I’ve read so far has accomplished that for me. Now that this series has ended, I wonder what Chadwick has planned next. I almost hope it’s a book about John. She’s already set him up as a slippery little weasel, so that should work nicely into a book focused on him. COVER NOTES: I’m so glad the US publisher stayed with the original cover design of The Summer Queen for the whole series…I like these better than the more generic artistic title-focused covers that the UK publisher switched to. The color palette ties nicely into the title. BOTTOM LINE: A fitting end to a wonderful trilogy on Eleanor’s eventful life. These three books provided a beautifully detailed exploration of the period. Great book and great writer. Elizabeth Chadwick has such a powerful way writing she draws you into the story so well.